So, I’ve eaten a few things in my absence, a lot or not much, depending on your perspective. I don’t eat out every day, and I don’t relentlessly pursue newness. I will likely elaborate on a few of these in the near future. 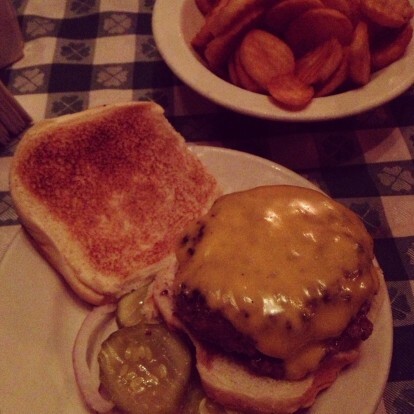 JG Melon: A belated birthday burger. My first time ever at the UES institution. 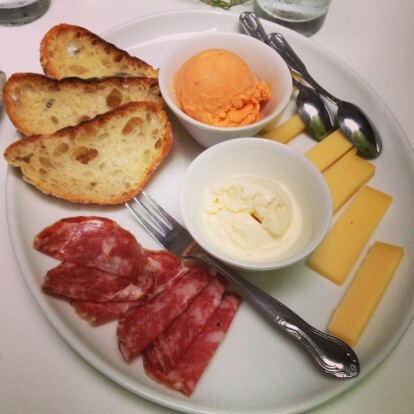 L’Albero dei Gelati: No salmon or blue cheese gelato, but the savories of the day, saffron and red pepper, were pretty nice paired with cheese and salami. broth, by the way). I will have to return. 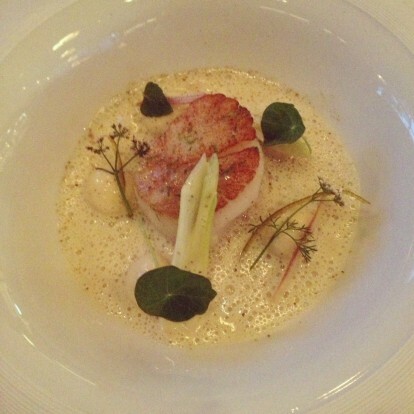 There was a tom yum scallop. from Seamless on a Sunday morning. Desnuda: Two visits ordering the exact same thing, $1 oysters and one of my new favorite cocktails, The Reformer (Cherry Heering, Elcano fino sherry, Avua Amburana cachaça, Peychaud’s bitters, and pasilla and scorpion chiles). The drink is spicy but almost melon-tasting, a surprise because I hate melon. 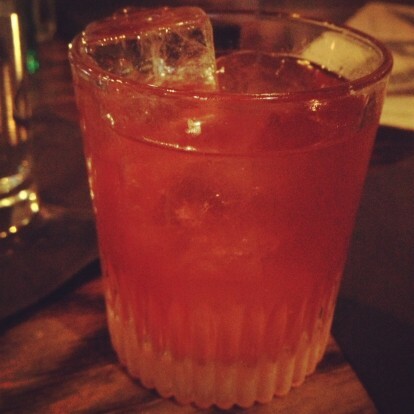 and something called Catcher in the Rye (Knob Creek Rye, Luxardo Maraschino, simple syrup, old fashioned bitters). The food was what you’d expect. Motorino: Delivery once, dine-in another time. The Brussels sprouts pizza is classic, despite not being particularly summery. 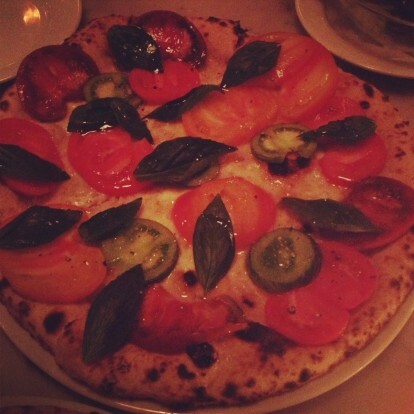 The tomato pie with four varieties made up for it with his hyper-seasonality. Sripraphai: They really don’t believe you anymore when you say you want things spicy, yet I still go. The nam priks and assorted chile pastes in the fridge are another story and I’ll always pick up two each visit. 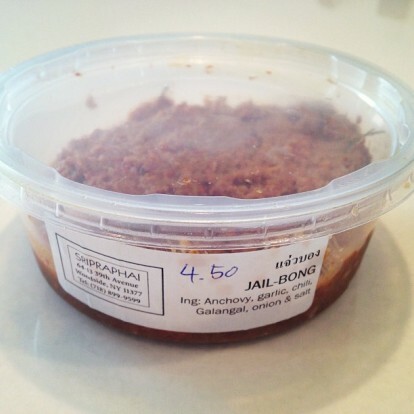 This so-called “jail bong” is blistering hot, humid garbage funky and delicious as all get out. It was described to me as being “like blue cheese,” but I would say it tastes like the fermented anchovies that it moslty is. Ootoya: Read more here. It’s the new Times Square branch. Pricier than a typical lunch, but also peaceful and not like anything else in the neighborhood. 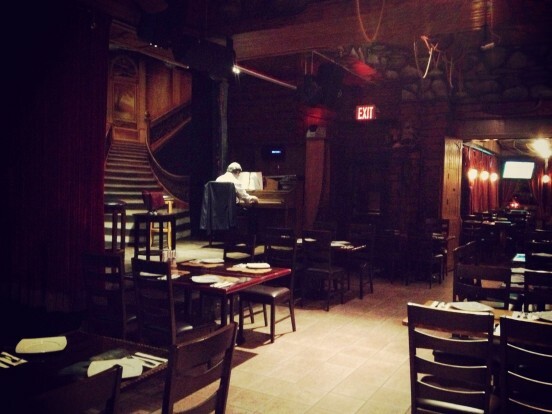 outside and drinks vodka and smokes—that’s why the indoor piano player is all alone. Jacob’s Pickles: When our waiter informed us that a marriage proposal was about to go down, all I could do was think about ruining it somehow, potentially using Twitter pre-emptively. Unfortunately, no diamond rings appeared to be lurking in the fried chicken biscuit sandwiches. Battery Harris: Somehow six pints of beer, jerk wings, two patties and a kale salad only cost $29. 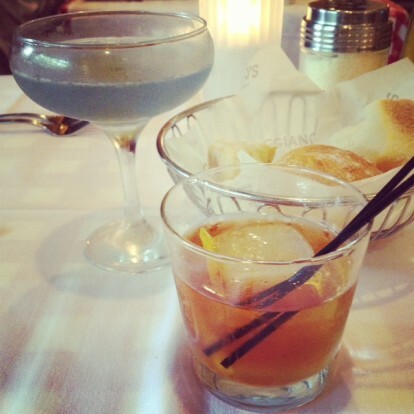 All-Monday happy hour is a feat. 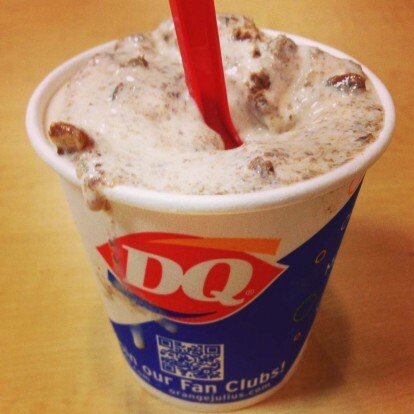 Dairy Queen: It took me 15 years to finally ride the Staten Island Ferry, and there was a mini Blizzard (my childhood fave, turtle pecan) waiting for me on the other side as a reward. Supposedly, there will be another Dairy Queen appearing in Times Square before the end of the year, and then it will cease being special. SanRasa: It wasn’t just the most interesting thing walking distance from the ferry, but also the only business that appeared to be open on Labor Day (even the Subway was shuttered). 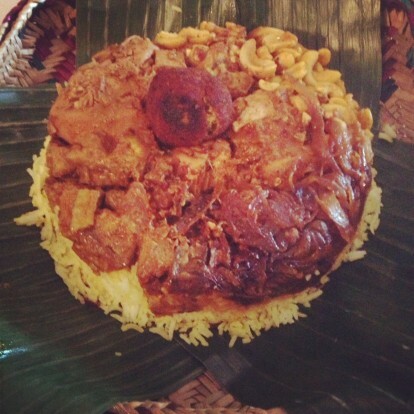 Lamprie, this enormous mound of basmati rice, caramelized onions, cashews and kingfish curry, a croquette that may have been fish or vegetable mush, topped with a paper umbrella and served in a banana leaf, is as good an introduction as any to Sri Lankan food. Sadly, SanRasa’s beer garden was closed. 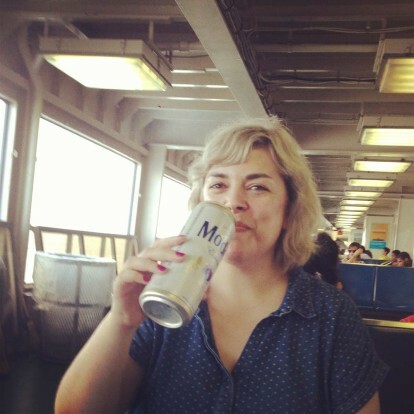 Luckily, I was fueled by a giant can of Modelo on the ferry. next table, so she at least got one celebrity sighting. 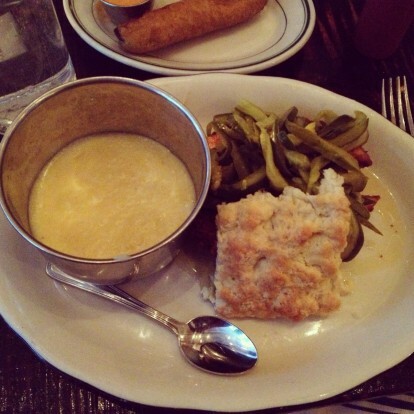 Mother may know best, but I ordered the creamed spinach (am I the only one who likes it?) despite her protestations. Dumont: Still a very good burger. 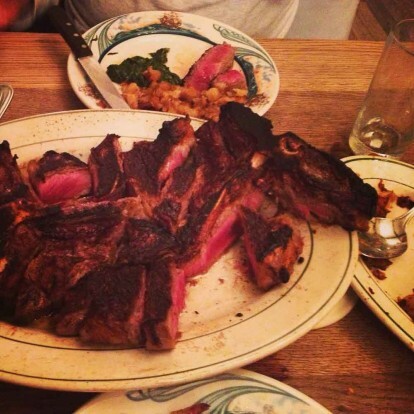 Medium-rare is taken seriously. 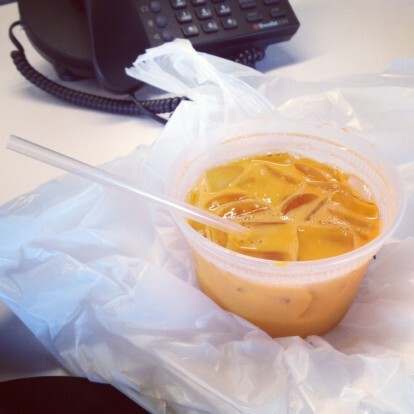 Qi Thai: I order delivery all the time at home, and pick-up duck salad for lunch when I’m at work in Times Square. I had never ordered Thai iced tea to go, however. Apparently, it comes in plastic takeout container. I guess it’s not so much weirder than how they put drinks in plastic baggies in Thailand. 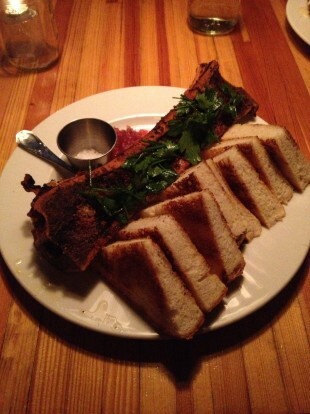 Brooklyn Star: Smoked bone marrow and Texas toast is probably meant to be a shared plate, but I made it my dinner last night. It’s good having a place to eat after midnight on a Tuesday. Sri Lankan seems more elusive than the ubiquitous Indian (or is it really Bangladeshi?) restaurants that are clustered in parts of the city. I was excited to try this new-ish East Village place because I'd only eaten Sri Lankan food once before in Staten Island and this seemed more convenient (though at the rate I've been going the past few years, I get to the forgotten borough more than Alphabet City). The style of food I had at New Asha was slightly different, heartier, more home style, less refined, and in some ways slightly more tasty. It was casual steam table fare. Sigiri, while hardly formal, is slightly more upscale in price and presentation. I don't even know what is quintessentially Sri Lankan, hence ordering benchmarks are nebulous. But black curry seems unique, and Sigiri offers a version with pork. The black is really dark brown, achieved by toasting of spices like…I'm not sure which spices. Hoppers also seem unusual, little crispy crepe-like vessels that come four to an order, three plain, one with a sunny side up egg embedded in the bottom. Sambol is served as an accompaniment, we chose coconut. We were warned about heat, but then, we always are and are always let down by wimpy-ness. Sigiri comes through, they really do mean hot when they say it. Our devilled prawns, which were grilled, came with onion, chiles and were slightly sweet and sour, but mostly spicy. The black curry was probably a notch hotter. We thought hoppers were eaten in lieu of rice, but had to order a bowl on the fly to combat the burn. The staff, or at least one waitress, seemed to know practically all of the diners. I don't know if everyone was regulars or if the Sri Lankan community in NYC is just really small and restaurants are so few. It's always weird when you decide to try a new-to-you cuisine and restaurant in a neighborhood you rarely frequent, and then days later the New York Times runs a review of the same place. Actually, they wrote up New Sunshine, which seemed like the more formal sit down Staten Island Sri Lankan, while I opted at the last minute for the hole in the wall contender New Asha. But I easily couldve gone to either. I've been meaning to try one of these restaurants for what feels like eons, and even had an acquaintance that used to live nearby. But I'd only do the S.I. trek evenings when he threw parties and these arent late night establishments. On this occasion we were forced into S.I. during Fourth of July weekend to patronize the only NYC Petsmart. Supposedly they carry this smart litter box for diabetic cats (they pee insane amounts and now our two other normal insulin producing cats wont use the boxes and are totally messing the house up). Despite being the most suburban borough, S.I. is still futilely and impossibly NYC, so accordingly they didnt have the litter box in stock or have any knowledge of its existence. Fine, at least I could get my Sri Lankan initiation. All I knew was that it must be similar to Indian (most likely southern Indian) food with perhaps some tropical influences. This is true; there is overt use of cinnamon, clove, coconut milk and pandan which leans kind of Indonesian/Malaysian. The food is spicy, but definitely not hot. As a condiment, they provide a carrot pickle interspersed with birds eye chilis, but even that was more pungent than incendiary. But then there are items that completely unique like hoppers, which are little crepe baskets made from rice flour. A sunny side up egg lay in the bottom of each hopper on display behind glass, shelved over the steam table. I'm honestly not sure if youre supposed to put food inside and treat the pancake like a bowl, or break pieces off like a papadum. We opted for rice topped with sides of the cooks choosing. I'm not used to putting myself in others hands, but its enlightening to see how they plate. Vegetables dominated, but we were also given separate small dishes of chicken and mutton curry, which were boney and oily, but not disconcertingly so. For starters we had "lentil cookies" and curried vegetable pastries, kind of like samosas, but rectangular. We were given generous portions of a dal-like lentil puree, soft-cooked sweetish green beans and a creamy pale yellow curry that I couldnt figure out, but really loved. At first I thought the main ingredient was potato, but the texture was too fibrous. Then I thought it might a root like yucca. But after asking, it turned out to be jackfruit, which I've had in Indonesian curry before, but it wasn't like this. Perhaps its the difference between canned and fresh? Jackfruit one of those mysteries where you cant find it in NYC (like mangosteen, which I know is illegal, and kaffir lime leaves, rambutans and galangal, which are not) but is freely available in Canada. It's not like their climate is more conducive to tropical produce, it must have something to do with import regulations. New Asha isnt big on atmosphere, there are four tables for dining in the front of what is essentially a to go operation, but its not creepy like eating inside a Chinese take out joint. And you could get Sri Lankan beer at the adjoining grocery store if you wanted to spruce up your meal.